The menu bar has a set of drop down menus for easy access to all the Cronus PRO functions, such as opening and saving script files, editing code, tools, displaying help documentation, interacting with the application and so on. This section covers the Cronus PRO's common functions, the explanations of specific functionality is covered in their own sections. Selects the Cronus PRO working panel: Online Library, Visual Scripting, Compiler, Programmer or Latest News. The panel selection can also be performed through keyboard shortcuts (Ctrl+1, Ctrl+2, Ctrl+3, Ctrl+4, Ctrl+5), as well as by the panel tabs. Check out the subject Working Panels below for a brief description of each panel. 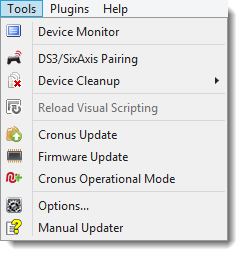 Available tools for monitoring and operating your CronusMAX PLUS, to check online updates and to configure options. • Device Monitor: This opens the Device Monitor window. To have access to this menu item the CronusMAX PLUS device needs to be connected to your computer via the PC PROG USB Port with a mini-USB cable. • DS3/SixAxis Pairing: In order use your DualShock 3 Controller in wireless mode you first need pair the controller with your CronusMAX PLUS. To have access to this tool the CronusMAX PLUS needs to be connected to your computer via the PC PROG USB Port with a Mini-USB cable. The Bluetooth pairing can be performed automatically, by setting the option in Device Options; or manually, through the wizard dialog box. Step by Step instructions are available for each controller in the Controllers section of the manual. • Device Cleanup: This has two options, Erase Memory Slots, which wipes clean all memory slots, and Factory Reset, which erases all memory slots and resets the device to its factory state, including all default settings in Device Options. • Reload Visual Scripting: Reloads the Visual Scripting user interface from the CronusMAX server. • Cronus Update: Cronus PRO has a built in update wizard that checks online for the latest version of the Cronus PRO software. The check is not performed automatically and it requires an internet connection. • Firmware Update: The firmware update procedure works much like the Cronus PRO update. It is not performed automatically, and requires an internet connection. • Options: The Options dialog window is used to control settings and preferences of the Cronus PRO software and of the CronusMAX PLUS device. • Manual Updater: The Manual Updater allows you to quickly and easily update your local hard copy of our manual to the latest version. The Cronus PRO functionalities can be extended with the addition of plugins. A plugin can access and modify the data exchanged between a game controller and the console, allowing creation of wide range of applications. A great example is the X-AIM plugin, which enables gaming on consoles with a keyboard and mouse, racing wheel, flightstick, fight stick, joystick (and so on) whilst using your Windows PC as a pass through device. All available plugins are listed in the Cronus PRO Plugins menu. • Cronus PRO Plugins: Instructions and Documentation of official plugins. The CronusMAX PLUS LED Display will change to a three bar sign, indicating there is a plugin handling the I/O data. The help menu contains links to our website and to our online community. You also have access to the User Manual, and other helpful links and documentation. The About Cronus link opens a window that shows you information about the Cronus PRO software and the firmware. This icon opens up the Device Monitor window. To have access to this tool the CronusMAX PLUS needs to be connected to your computer via the PC PROG USB Port with a Mini-USB cable. The Device Monitor shows all real-time information about your CronusMAX PLUS: the input and output data, LED, rumble and battery information, CPU load and the loaded memory slot. You also have access to operations such as: turn-off a wired controller, change the current memory slot number and unload the running slot. Check out the topic Device Monitor for more details and operational instructions. • Online Library: Interface for viewing and downloading GPC scripts from our online database. It is a quick start for those who don't have any familiarity with programming and want to make use of the available GPC scripts shared by the CronusMAX PLUS community, or for those who are interested in learning more about the GPC script language through examples. • Visual Scripting: The GPC Blockly programming environment provides a more accessible introduction to coding. The Visual Scripting tool allows users to create and run GPC Scripts, MODs and customized GamePacks by arranging blocks with a simple click, drag and drop. • Compiler: Features an integrated development environment (IDE) that provides comprehensive facilities to programmers for GPC scripting development. It consists of a source code editor, syntax highlighting, integrated GPC compiler and testing tools. Programmer: Gives easy access to all GamePacks, GPC Scripts, Remapping Profiles and GPC Files, so you can program any combination of those to your CronusMAX PLUS memory slots. 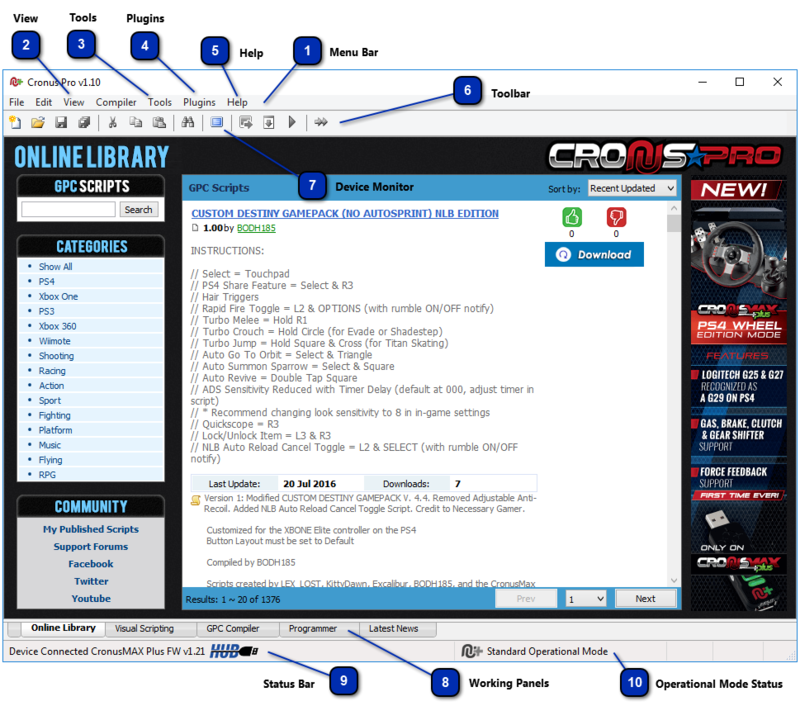 • Latest News: The Latest News panel displays the most recent releases, promotions, announcements and contests from CronusMAX, as well as useful shortcuts to specific web pages, documentation and even competitions and prizes. The Status Bar is an information area for the Cronus PRO software, and can be found at the bottom of the main window. The status bar is divided into sections, each of which shows different information. The very first section displays the information from the device, if it is connected or not and the firmware version. The other sections are for displaying information about the Operational Mode and the code editor. The Operational Mode area is also clickable - it launches the Cronus Operational Mode Wizard. For example, the status bar below is showing that the CronusMAX PLUS is connected with 1.21 firmware and is in PS4 Wheel Edition Mode. The Device is USB Hub compatible (The USB Hub logo is in color). The GPC editor is open and the cursor is on Line 18, Column 2 and INSERT is enabled. 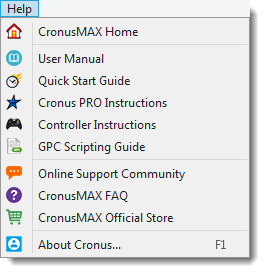 If you hover your mouse over the firmware version area, a popup will also display detailed information about your CronusMAX PLUS. Displays which Operational Mode the CronusMAX PLUS is in. The three available modes are Standard Operational Mode (Normal Gaming Mode), Tournament Edition Mode (All GamePacks and Scripts Disabled) and PS4 Wheel Edition Mode (Connect any Logitech G25 or G27 directly to a PS4 with full Force Feedback support, Gas, Clutch and Brake pedals support and 6 Speed Gear Shifter support with no special scripts and no plugins or PC connection required). You can either select Tools > Cronus Operational Mode from the menu, or you can hover over the Operational Mode on the status bar and click there to change the mode. Click here for more information.